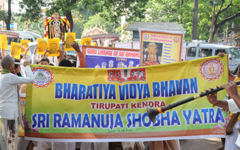 Bharatiya Vidya Bhavan, Tirupati Kendra organized 11th Sravana Sangeetha Lahari Programme in the holy month of Sravana which brings out the festive mood and enhances spirituality. This year it was a mega twin-day programme, which was conducted on 16th and 17th August, 2016. It was a music and dance ballet depicting Sri Ramanuja Vaibhavam. 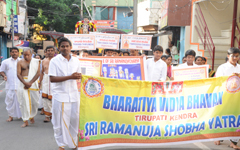 Nearly 300 students traced the important facets in the life of Sri Vaishnavite Saint Ramanuja. The ballet introduced Ramanuja as the incarnation of 1000-hooded serpent Adisesha in Kaliyuga, whose inseparable bonding with his master makes him appear in various earlier eons as Lakshman (Threta Yuga) and Balarama (Dwarapa Yuga) ardently following Lord Vishnu. The day’s Chief Guest Prof. K.E. Devanathan, Vice-Chancellor, Sri Venkateswara Vedic University, Tirupati lauded the awe-inspiring concept and painstaking effort by the students. Speaking on the occasion, Guest of Honour Sri N. Mukteswara Rao, I.A.S., Special Officer, All Projects, Tirumala Tirupati Devasthanams, gave an insight into the life of Sri Ramanuja, by narrating a few incidents showing the sympathy towards down-trodden and portrayed the saint’s egalitarian nature. It was a mesmerizing experience to witness the Sri Ramanuja Shobha Yatra on 17th August, 2016 in the early hours from Sri Govindaraja Swamy Temple to Alipiri, the foot of Tirumala Hills, which was formally launched by Sri Satagopa Ramanuja Periya Jeeyar Swamigal and Swamy Anupamanandaji, Secretary, Ramakrishna Mutt, Tirupati. Students of Bharatiya Vidya Bhavan, Tirupati Kendra in traditional costumes took part in the procession and recited pasurams and hymns upto Alipiri. A skit of the incident that had happened exactly at Alipiri nearly 1000 years ago was enacted by students with perfection, near Srivari Padala Mandapam, Alipiri. Young Ramanuja learnt Ramayana from his maternal uncle Tirumala Nambi under the shade of a tamarind tree at the Foothills of Tirumala. The tamarind tree under the hills was then called Adipuli in Tamil which later came to be known as Alipiri. Bringing the incident in the form of skit students dressed as Ramanuja and Tirumala Nambi sat at the same spot and students recited the verses from the epics concised form Sankshepa Ramayana. Infact, there is historical evidence of Ramanuja having visited Tirumala Hills thrice during his life time, all on his knees. Rich tributes were paid to the 11th Century Philosopher who fought for an equalitarian society.